← Could you be the next Ford, Jobs or Musk? We’ve spent several weeks discussing your vision for success, and whether you could be the next Ford, Jobs or Musk. Now it’s time to make this more tangible, more real – by attaching personal goals to this vision we’ve created together for you. So, your vision tells the world what you want to be as you contemplate how you will change the world for the better. But your goal is a tangible aiming point, one that should be achievable within several years if you accomplish your progressive steps planned between now and then. You can express it in terms of money, market share, influence or other measure that reflects success. Here’s a business example: “To be at a $25 million run rate by the end of our fifth year in business.” That is measurable. From it, you’ll be able to look backward to develop a set of steps (strategies) to achieve that goal. [Email readers, continue here…] Once achieved, a goal is meant to be overwritten with a newer one, set to even higher standards. If achieved early, celebrate and set another goal earlier than planned. The good thing about a goal is that it is measurable, and progress toward it can be measured as well. Unlike your vision, which can’t be measured, there is a satisfaction in each step toward achievement of your goal. For business goals, your employees and investors will appreciate constant attention to the goal and reports of progress toward it. A goal serves as a rallying point for all associated with your vision. Make the goal realistic, achievable and public. You’ll find others buying into the objective and even creating better ways to achieve it because they are invested in the dream and the measure of that dream – the mutual goal. 1 Response to Have you set your life and business goals? 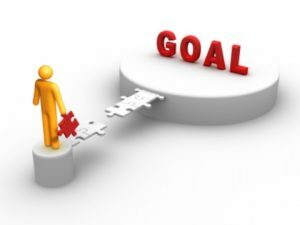 Goal setting not only allows you to take control of your life’s direction; it also provides you a benchmark for determining whether you are actually succeeding.